There's not a day that goes by that I don't think about turkey season. That might be a strange thing for a professional wingshooter like me to say, but it's true. I simply love turkey hunting that much. I've often tried to pinpoint the reason and I think I've got the answer. I mean there I am shooting doves and pigeons in Argentina by the hundreds, make that thousands, and my mind is really on that old gobbler that gave my hunting buddy and I the slip late last season. I guess that's it. Shooting birds is easy....turkey hunting not so easy. Of course there are days when enticing a strutting, gobbling tom to the gun can be a piece of cake. And then there are days when I don't think I know anything about hunting turkeys at all. Over the years I have learned that sometimes those 'hard to get' gobblers are more a product of my failures in the turkey woods than them being not willing to commit to the gun. Let's throw some stuff on the wall and see what sticks. In my mind hard turkeys start getting hard early in life. For most of the year, the turkey gobbler doesn't have much to do at all. He sleeps, eats, drinks and tries to stay alive another day. 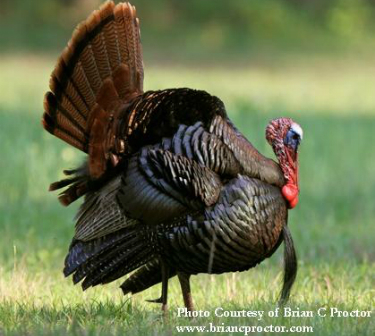 Don't forget that the wild turkey is a tasty critter, and there are lots of predators who would want him for lunch. As a result, every step a bird takes could be his last, and he knows it. So when we humans start to infiltrate his domain, he looks at us with a scrupulous eye. In the Fall, gobblers tend to bunch up into bachelor groups, and for whatever reason, they aren't quite as wary. Maybe they see their strength in numbers. Yet as spring approaches, the gobblers' demeanor changes quickly. He is more skeptical of everything he sees. He trusts nothing, not even his fellow gobblers. In the springtime, he tends to be a lot more alert; most likely because there are more of US in the turkey woods. And don't think that Mr. Tom doesn't notice when things change in his world. You can bet that trucks, ATVs, and UTVs are noticed, especially when he's on the limb before flydown time. He also notices the increase in hen music from our callers in his neck of the woods, and let's face it, the wild turkey hen is not always as vocal as many of us would think. Where I live in the Deep South, a loud yelping or gobbling turkey draws predators of the four-legged and two-legged kind. For most of the day, hens walk, feed, yelp, cluck and purr softly. On occasion they will be more aggressive with their yelps and cuts, but for the most part, they are pretty quiet. I mentioned that the wild turkey has lots of enemies who would have him for lunch. He also has many friends who would warn him in advance of your arrival so he won't become lunch. Let's face it-it's Mother Nature's way for birds and animals to have some kind of alarm system to warn their kind of approaching danger. The wild turkey knows and respects those warning signs, and his alert system is turned up a notch when he hears them. I've always contended that the best woodsmen make the best turkey hunters. Those are the hunters who can slip almost unnoticed through the turkey woods have an advantage over hunters who sound like an army of one by cracking sticks and leaves as they walk. You'd just as well be waving a flashlight and clapping your hands. When you do that, you can rest assured that in most cases, he's gotcha! Woodsmanship encompasses a lot of things like understanding the critter you're hunting, knowing the area where you are hunting, listening to the sounds of the woods and understanding what you are hearing, knowing what to say on a call and when to say it and having an understanding about when and how to move. I work really hard on my calling, trying to get the yelps, cuts and cadences just right. I'll never be an award winning contest caller, but I kill a lot of turkeys and you can too if you can get the call cadences right. All wild turkey hens don't sound like the pure notes you might hear at a sanctioned turkey calling contest. Some of them simply sound terrible, but regardless of how the notes sound, the cadence is always spot on. A lot of one's success in the turkey woods can be attributed to significant patience, being in the right place at the right time and being careful to sound more like turkeys in the woods than a bunch of turkey callers listening to themselves make noise. Unfortunately there's more of “hearing yourself call” than there is actually working a bird the right way. We get caught up in watching turkey hunts on TV shows and hearing the loud yelps and cuts that always seem to work. Just remember that every bird is different. Some want to be called to and some don't. Just make sure that you've got enough tools in your turkey hunting tool kit to deal with those different personalities. If you think about it, you can see how the things I just mentioned can serve to educate the wild turkey. In his world, none of what I just discussed exists for more than 10 months of each year, so you can see how a change in his lifestyle can alert him. When things change, he simply becomes more cautious and wary. Don't forget that he's not supposed to come to your calling anyway. Mother Nature says he gobbles and the hens come to him for breeding. So count your blessings anytime you win in the turkey woods. All wild turkeys are born with an inbred sense of survival. They're tough enough without any assistance from you. So take the time to learn the bird and the area you're hunting. Don't press the issue. That bird is on his time and not yours, and he will move as he sees fit. You can push it, but you will most likely go home empty handed if you do. Good luck and remember to "shoot 'em in the lips!" For more information on Marty Fischer, be sure to visit his website: www.martyfischer.com!